If your child loves parties, but you don't always love planning them here's a collection of 50 ideas for new, unusual, and easy-to-create celebrations for every occasion -- birthdays, national and religious holidays, special family days like a new home or a new baby -- that will not only thrill children but adults as well. 50 Fabulous Parties for Kids will show you how to choose a theme, make an invitation, select party crafts or games, and decorate a fun-shaped cake to go with the theme. Parties are age appropriate, from three to twelve, have themes popular with all children and will not require expensive materials or excessive amounts of time. 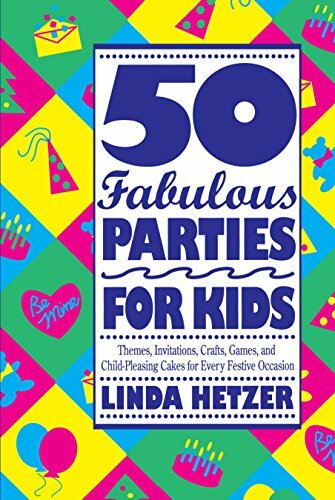 50 Fabulous Parties for Kids is an invaluable sourcebook for any special event involving children. Linda Hetzer is the author of The Simple Art of Napkin Folding, Successful Entertaining, and the Illustrated Crafts series and a contributor to the Reader's Digest Complete Guide to Needlework.